Do you know that you don’t need any cream or botox to remove wrinkles the natural way? Photos of my mother taken in 2011 and 2013, age 55. Can you tell me which photo looks older? See if you can guess what year both of the photos were taken? If you’re like everyone else I showed this photo to and think image 2 looks younger, you must be thinking that I’ve made a mistake! People can’t reverse! Surely there’s a mistake. Actually, I have the original, absolutely unedited photos with the date taken still in written on it. If anyone is skeptical, feel free to ask me for the photos. Ingredients: Patience, strength on your hands and persistence. Hard massage on all areas of your face. 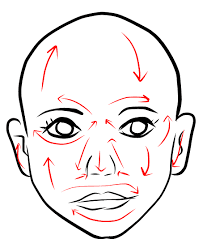 The diagram above gives you an idea of the areas you should massage, but you really just ignore the specific points and massage every part of your face. From personal experience, it is important that you put strength and take the pain as much as you can, because when you’re pressing it very hard, you’re not only increasing blood flow, you’re also getting rid of the stagnant blood and damaged tissues. I personally feel that without the massage feeling painful, results are extremely slow to non-existent. A day or two after you massage, your face may even appear swollen, very painful/sore and bruised, but it is important to know this is just the healing process and takes about a couple of weeks for it to disappear. It always gets worse before it gets better. You may think you look even older for a while, and have greater wrinkles. Please don’t give up massaging or freak out because the body needs to first toss out all the rotten materials before it can build new ones, and that takes time. If you are patient, I guarantee that you will be rewarded with amazing results in time and will be well worth it. How to Massage: Press with your thumb and fingers on your face as hard as you can take it without actually making a hole. Do this continuously for 15 minutes every day or about 1-2 hours every week, particularly around the nose and eyes.